Colorful décor comes in many funky ways, simple but true. If painting the walls just isn't in the cards, but adding color is, you can do it by including wall and furniture items that hold colorful, necessary home accessories. Instead of having a drawer filled with a collection of colorful and expensive nail polish, display them in a stylish metal rack on the wall. The functional dual purpose of a nail polish wall rack makes it an original accessory for a washroom, dressing room, vanity desk area, or the bedroom. The racks themselves are fairly reasonable in price so acquiring a couple to fill a large nail polish collection won't break the bank. Best of all, with two metal wall racks you have double the wall art. Don't hesitate to give a nail polish wall rack as a gift. These items tend to be labelled 'perks' that most people won't bother treating themselves to, so receiving one would be a treat. If there's someone in your life who's known for their massive collection of nail polish, this item could be a hit! Plants add energy, freshness and style to a room. Often times we want to add plants, but after looking around the room, come to the conclusion there's no place for them. 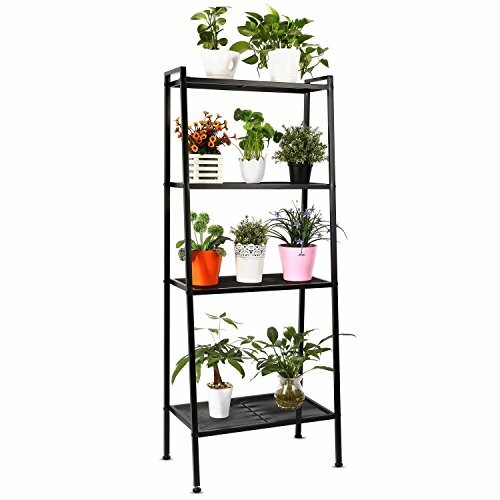 If you use a wall to feature a Ladder Plant Stand, you're able to locate that stand in one appropriate place in the room to display multiple plants. Most importantly, you've added color to the room without painting the walls by using multi-colored flowers and plants. How nice is that ... instead of toxic paint, you have lovely air freshening plants. New kitchen's normally have spice drawers, and older kitchen's tend to have spice cupboards. Who says you have to use either. If you're not one of the fortunate who have a modern pull-out spice cupboard located along side of the oven, then you're free to take all your colorful spices and feature them on the wall by using a Spice Wall Rack. The metal spice racks are particularly stylish. They fit with virtually any décor style; modern, rustic, country, contemporary, and traditional. Place it for all to see, as you would any piece of wall art. 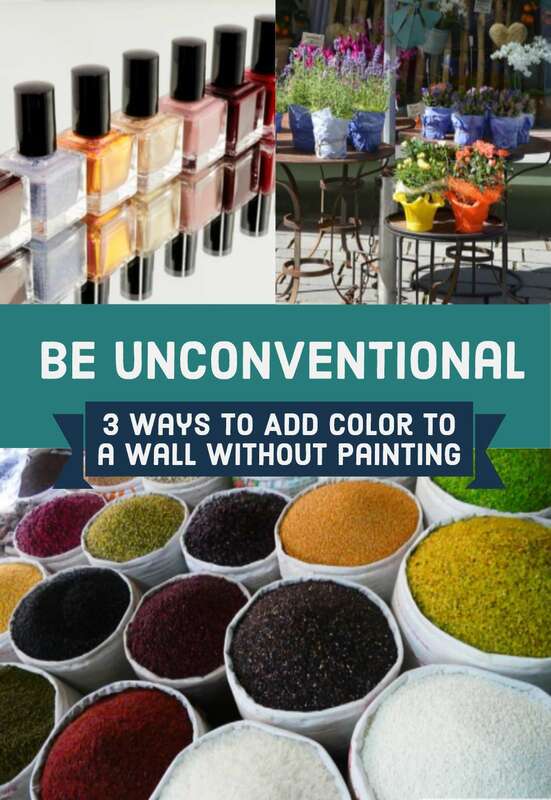 And there you have it, three easy-peasy ways to add color to the walls without painting. Pat, it really does sound like a plant ladder could work for you. I have the problem in my living room of where to put them but a plant stand could also be my solution. Plants add so much to a space. I’ve had the same two plants in my family room for about fifteen years maybe longer, and would love to add a few more in that room as well. These are all wonderful suggestions! I love the looks of the nail polish rack and actually looked at the possibility of using it for my spice rack. After measuring my kitchen wall area above the stove, I found I don't have enough room for it there. Such great sadness! 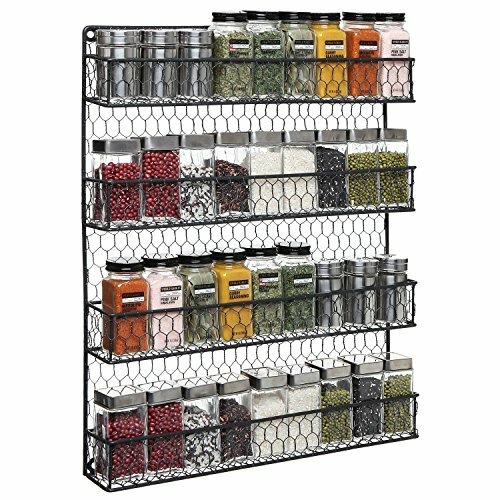 I really want a pretty spice rack. I realized this past Thanksgiving how much I need one. Therefore, my resolve is either to find a place for the pretty tree rack for my spices, or I will buying the more traditional style featured above for spice. the tree one looks like the wire shelf bar may not come up high enough for spices, but I could be wrong about that - I would love one in my kitchen too, but maybe a reno is in our future so I find myself holding off on getting some of the more fun accessories - great gifts for people though!